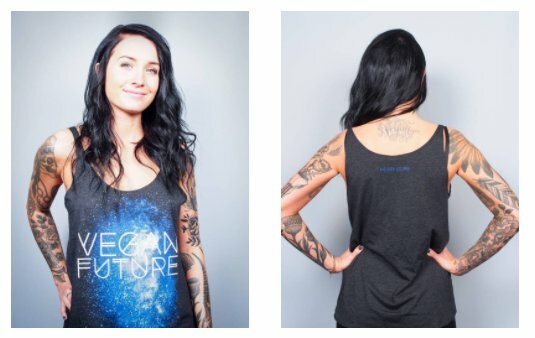 Your Favorite Vegan Future Tank Is On SALE! We care about the vegan future, and we care about you, vegans! That's why we put our Vegan Future Slouchy Tank on sale this week for $20! We Can't Wait For The Vegan Future! Seriously. The vegan future is on its way, and we couldn't be more excited. Be the change you want to see in the world, right? Well, we are that change. Our vegan future gets closer each time we act and eat with compassion, and we can't wait! Every day that we leave animals off our plates, we save the lives of those animals, we fight to preserve our environment, and we nourish our bodies with compassion rather than cruelty. This is the future we see for the world: a community built from kindness and respect. -The Team at Herbivore Clothing Co.